Mr. G's musings: BARBRA STREISAND's NEW album. Who Knew? What a great, understated new album by the original Diva herself. Lady Gaga? Mariah Carey? Who's that? No one....and I mean NO ONE embodies every element of the term diva more than this goddess. Before anyone (except Garland, Callas, and Merman) there was and is La Diva Streisand. This album is a lovely selection of some of my favorite old standards. Before her overdone symphonic albums like Yentl, etc, Ms. Streisand was putting out some of the most brilliant works ever recorded. This album harkens back to that time, in my opinion. The entire collection of songs and Streisand's restrained and brilliant vocal interpretation coupled with the exquisite piano and instrument arrangements by Diana Krall and her band, make this in my opinion one of the diva's best albums ever. Here's two of my favorite songs that are on her new album. See what I mean. Sheer perfection, this woman. 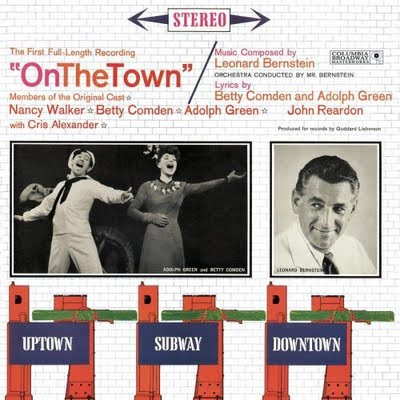 On the Town is a musical with music by Leonard Bernstein and book and lyrics by Betty Comden and Adolph Green, based on Jerome Robbins' idea for his 1944 ballet Fancy Free, which he had set to Bernstein's music. The musical introduced several popular and classic songs, among them "New York, New York", "Lonely Town", "I Can Cook, Too", and "Some Other Time". The story concerns three American sailors on a 24-hour shore leave in New York City during wartime 1944. Each of the three sailors becomes enamoured of a particular woman — and of the city itself. On the Town was first produced on Broadway in 1944 and was made into a film in 1949. The show has enjoyed a number of major revivals. The musical integrates dance into its storytelling: Robbins made a number of ballets and extended dance sequences for the show, including the "Imaginary Coney Island" ballet. See my other blogs about the masterful Leonard Bernstein. Lyrics by Fran Landesman, set to music by Tommy Wolf. Landesman's first career was in the fashion industry in New York. She and her husband then moved to his home of St Louis, where he and his brother started up the "Crystal Palace", a cabaret. This was a successful venture, attracting big-name acts as well as producing avant-garde theatre. Fran Landesman's experiences sitting in the bar of the Crystal Palace, listening to musicians and audiences, led her to begin writing song lyrics in 1952. One of her best-known is "Spring Can Really Hang You up the Most", her exploration of T.S. Eliot's "April is the cruelest month..." The Palace's pianist Tommy Wolf set her lyrics to music, and the song became a hit, leading to more Landesman–Wolf creations. This is an album for anyone who truly is devoted to the honest telling of brilliant lyrics, songs sung angelically, and the emotional landscape realized perfectly.